Phoenix, AZ – November 10, 2017 – ABI Multifamily, the Western US's leading multifamily brokerage and advisory services firm, is pleased to announce the $1,600,000 / $1,896,489 Per Acre / $43.54 Per Square Foot land sale for the Aeries Townhomes development located in Scottsdale, Arizona. Situated near the intersection of 70th St and Osborn, the fully entitled and permit ready development rests on approximately .84 acres in a premiere Scottsdale location. The development plans call for a three-story condominium community whose design incorporates a contemporary and modern style. Upon completion, this luxury property will boast an attractive unit mix of 16 - 2 bedroom units with attached garages and a weighted average size of 1,847 square feet. "The buyer just completed another similar project in Phoenix, which was very successful and is starting another one in Phoenix as well. This opportunity was a natural fit for the buyer," states Alon Shnitzer, lead broker for the Buyer and Senior Managing Partner at ABI Multifamily. 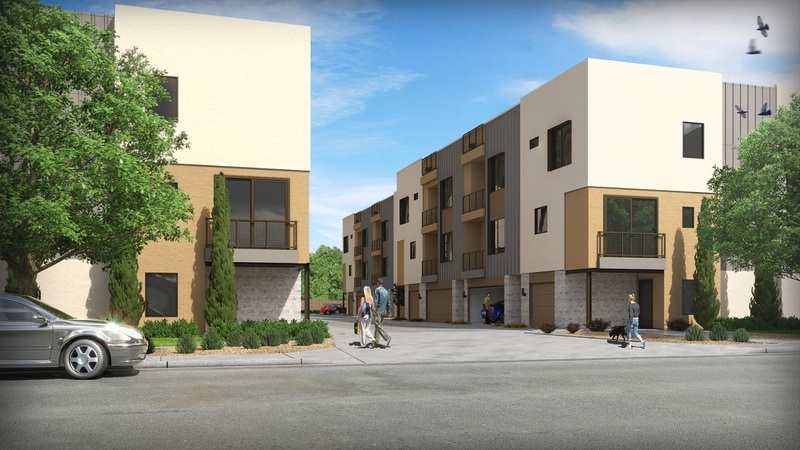 This development is located in the heart of South Scottsdale and in one of the most sought after submarkets for development in the Phoenix-MSA. Aeries is approximately one mile from Scottsdale Fashion Square and Entertainment Districts and is walking distance to Old Town Scottsdale, the Giants Spring Training facility and Scottsdale Civic Center Plaza. "The South Scottsdale submarket has long been one of the strongest in the Phoenix market and has done well with for-sale and for-rent product," states Eddie Chang, Partner at ABI, who along with Patrick Burch and John Klocek represented the Seller. "The seller had great success with previous similar projects nearby, paving the path for the buyer to have continued success." The Buyer is a private developer based in Canada. The Seller is a private developer based in Arizona. The multifamily brokerage team of Alon Shnitzer, Eddie Chang, Patrick Burch, John Klocek, John Kobierowski, Rue Bax, and Doug Lazovick represented both the Buyer and Seller in this transation.